The Four on the 4th Dog Jog & Walk starts and finishes at Ashwood Park next to the Bellevue Library. Parking is available free of charge at the Bellevue Library. Temporary traffic impacts will be experienced along 108th Ave NE (between NE 10th & NE 24th) northbound from 9-10am and NE 24th Street (between 108th Ave NE & 112th Ave NE) eastbound from 9-10:15am. Residents and others looking to travel the roads during this time are welcome but reroutes will be in place until the route is clear of participants. The event will be supported with course monitors and Bellevue Police officers assisting with keeping participants safe and routing vehicular traffic. Contact Mike or 425-453-3110 with any questions. 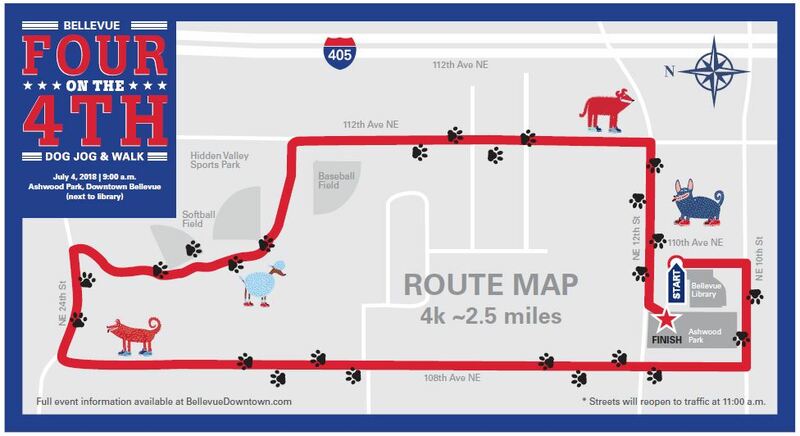 The Bellevue Four on the 4th Dog Jog & Walk covers 4 kilometers and is a noncompetitive event.